We finally did it! 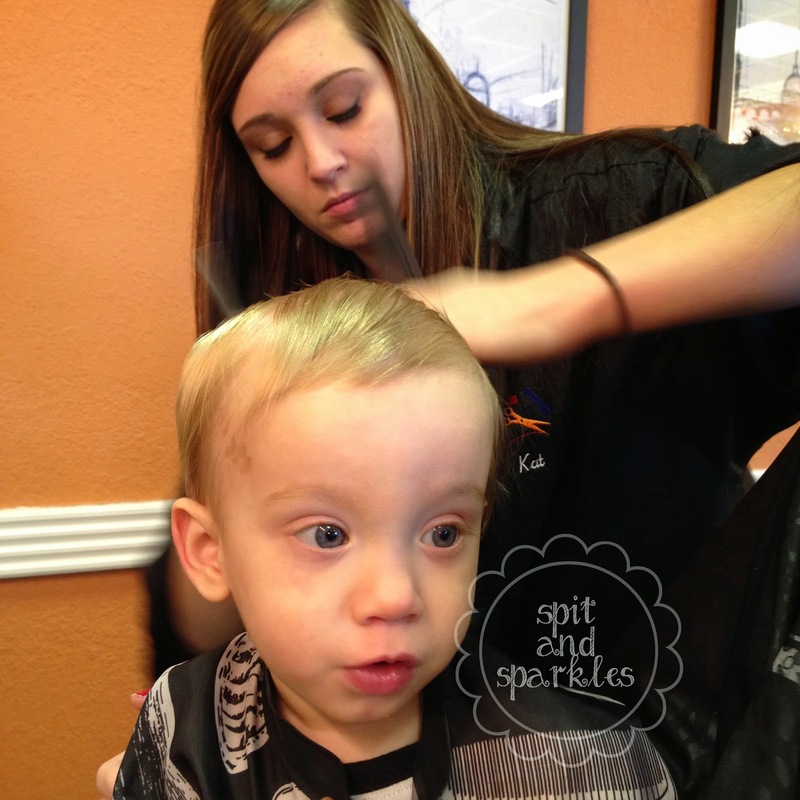 During our Christmas vacation, we took Corbin to get his first haircut! 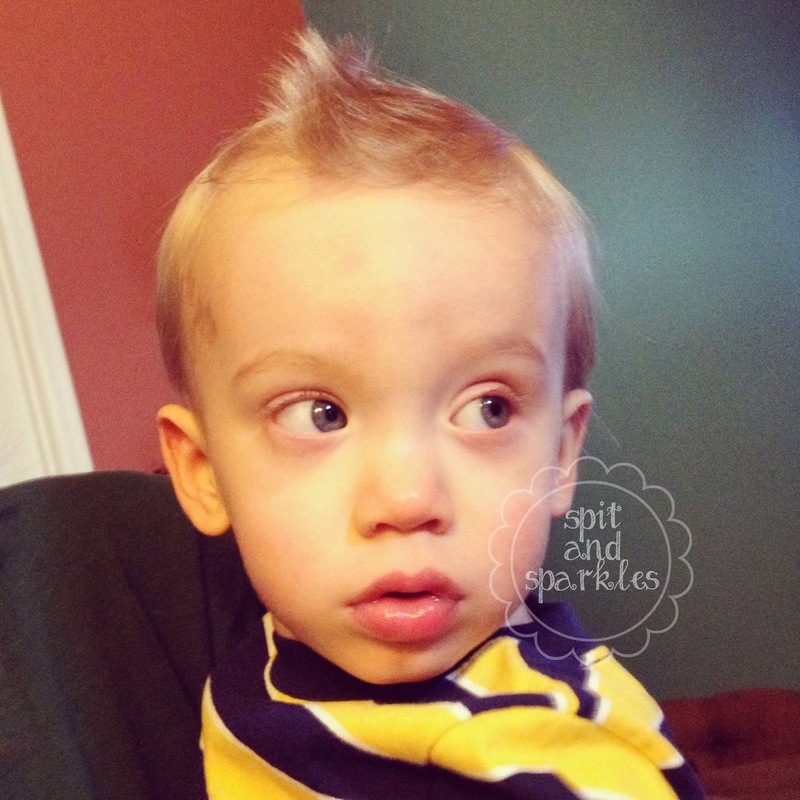 It was such a bittersweet occasion, as I watched my baby boy’s wavy blonde hair hit the floor. Within ten minutes, he went from looking like a precious baby to resembling a strikingly handsome little boy! I thought I would cry, but I didn’t. And he didn’t cry either! SCORE. 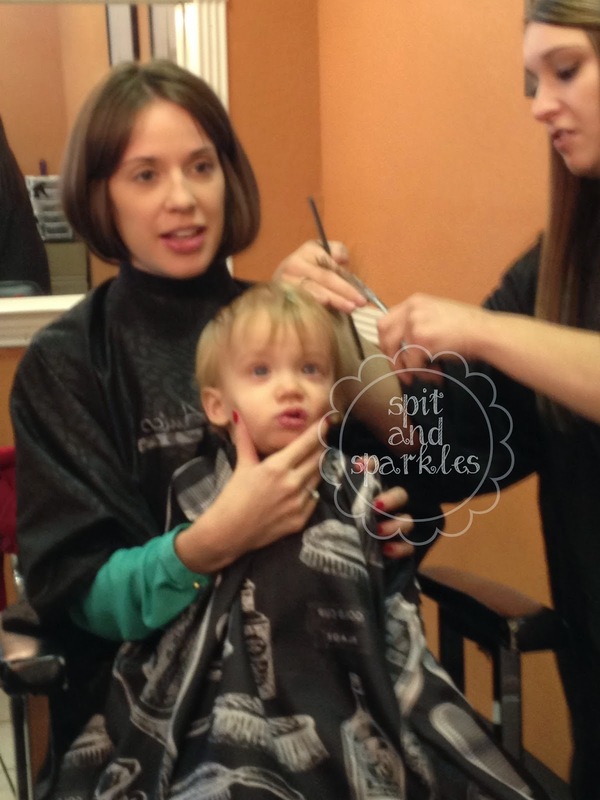 We had been planning on taking Corbin for his first haircut since October. I decided to wait because he needed his long, poofy hair to be Fred for Halloween. 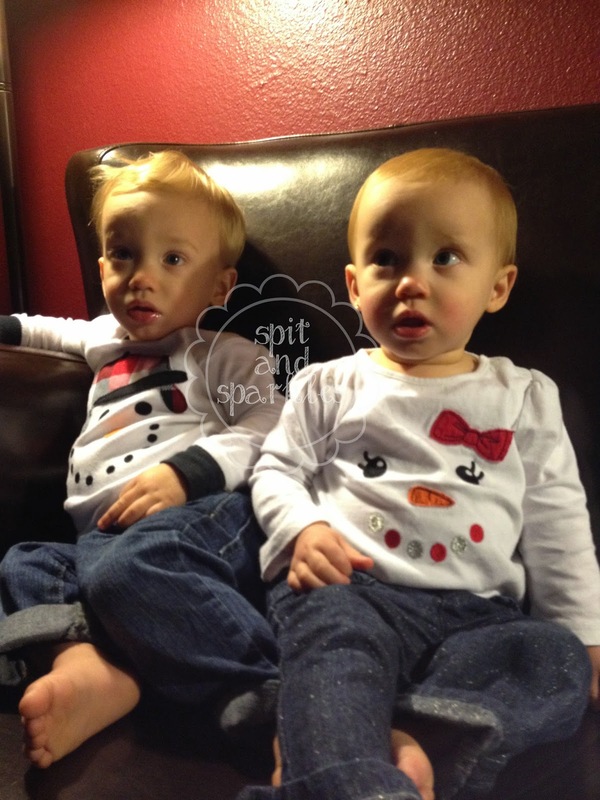 And then, he, Lynley and me all got sick for a week in November. Then we went on a nightmare cruise, and then before we knew it, we were travelling to see my family for Christmas. On Christmas Eve, my mom mentioned that we should see if Mrs. Judy could cut his hair. Mrs. Judy is a longtime, family friend who’s cut all of our hair at one point. She’s watched my mom grow up and all of us “kids” grow up, so this was perfect! I hadn’t even thought about asking her to do it, and if she couldn’t, then I still didn’t want to pass up the chance to show off my little pumpkins. So, we loaded up the babies and drove just down the road from Nanner’s house to see our favorite beautician. Mrs. Judy was ecstatic to meet the twins! She and mom talked for a few minutes reminiscing about me and my siblings as babies/young children. And then we asked if she had time to fit Corbin in. Sadly, she couldn’t do it, but one of the other ladies was able to do it. 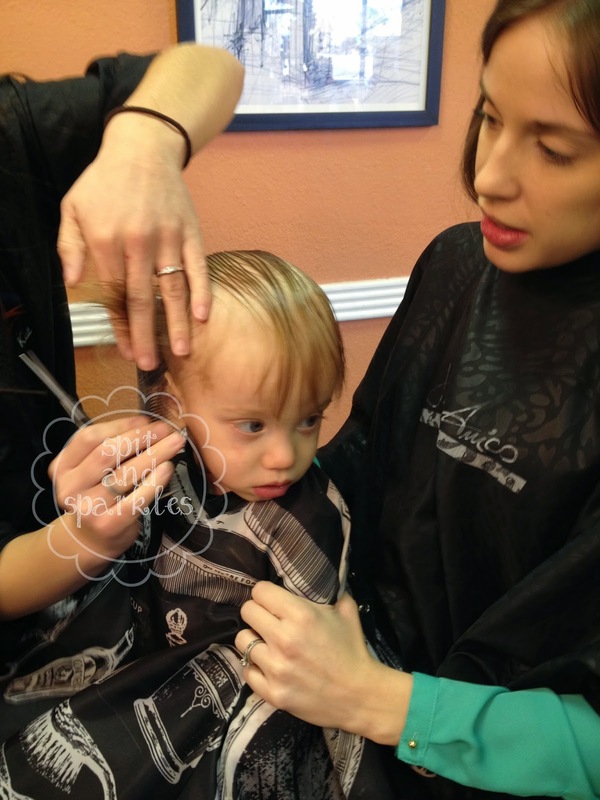 She did a great job considering Corbin kept trying to grab the scissors and her hands. Cheerios solved that problem, and he sat so sweetly and calmly just staring at himself in the mirror. It was absolutely precious! Here are more before, during and after photos. 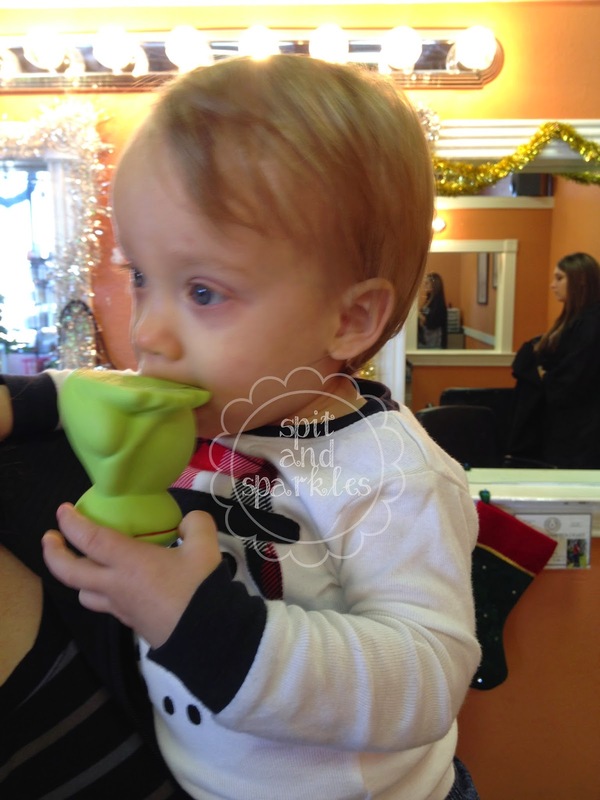 When a boy gets a haircut, he has to get a new comb, right? It’s a tradition that my PawPaw loved to share with my brothers when he took them to the Barbershop for their haircuts, so I kept that in mind for Corbin. 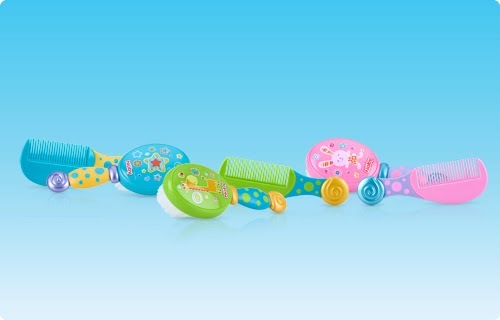 Just so happens that we received a cute, new brush and comb set from Nuby for each of the babies to review. I actually love these sets so much. The brush bristles are super soft and fine, unlike our previous brush which had hardened after getting just a little wet. 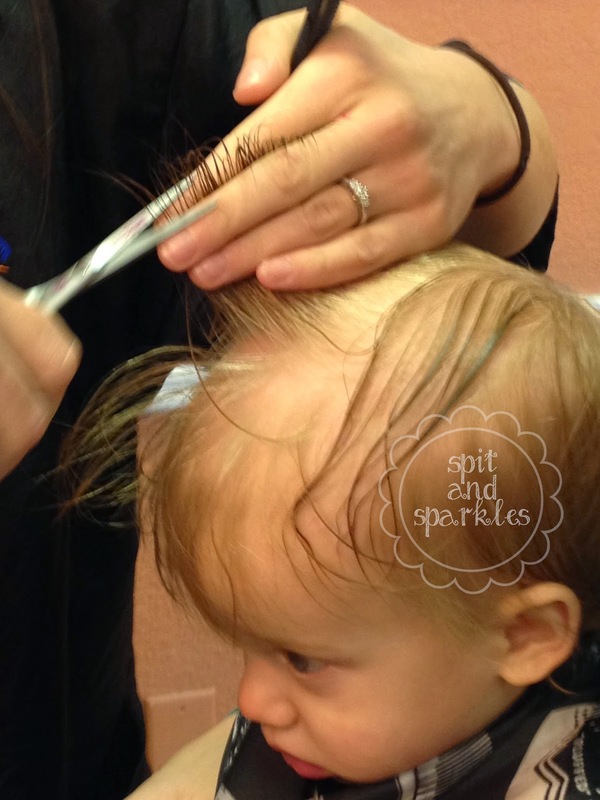 The comb is perfect for giving Corbin a little “fauxhawk,” and for styling Lynley’s tiny curls. They love to play with brushes, but haven’t figured out that they are not chew toys! That’s why our other baby brushes got ruined. I’m glad they have combs to chew on now! And you guessed it, Corbin likes the pink one!! From Nuby: The Nûby™ Comb and Brush Set by was designed especially for baby. 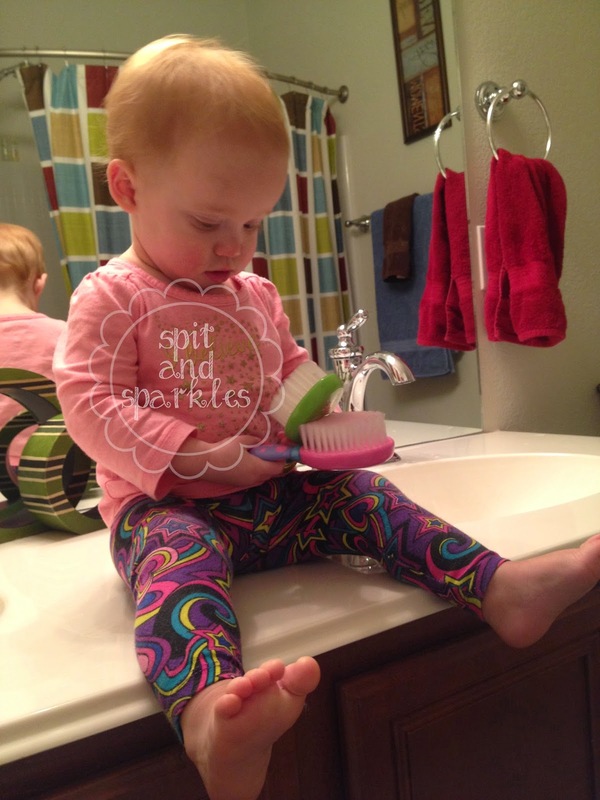 The nylon bristles on the brush are soft and gentle to baby’s tender scalp. 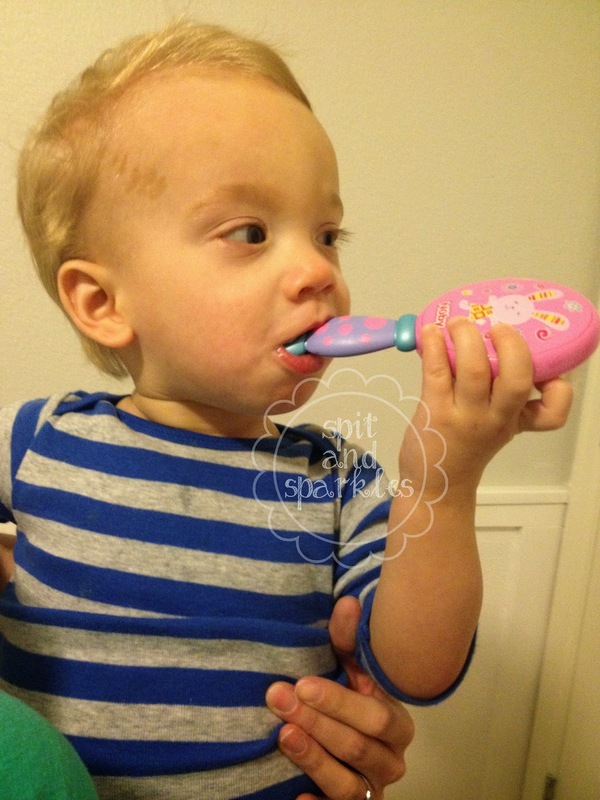 Both the brush and comb are sized for baby’s needs, but are comfortable for an adult to use. You can find this item at Baby Depot at Burlington. We have never been disappointed with any of our Nuby items. It’s been our go-to brand for feeding utensils like spoons, bowls and sippy cups for many months now. I have another review coming up on mealtime products soon!